A research theme : "The study on a special synthetic magnetic field"
"The use technology of a special synthetic magnetic field" is the research results that were brought by item (13) of "Test data in Chapter 1", item (14) of "Test data in Chapter 2" and item (15) of "Test data in Chapter 3". Above all test data exist on the bottom of this website. "Drastic improvement technology of fateful exhaust-gas treatment technology of an automobile"
(a) About 130 years have passed since gasoline sar was invented by Daimler until today. (b) As far as the driving principle of automobile is based on the explosivethermal expansion pressure due to th combustion of fuel oil , reduction of exhaused gas by thecombustion becomes inevitably a fatal technology. (c) However, despite 130 years since the invention of the automobile by Daimler, a drastic technology that can simultaneously greatly reduce carbon dioxide (CO2) due to complete combustion and harmful exhaust gas due to incompletecombustion, fas not been developed to this day. (d) For that reason, it has already been announced that the manufacture of conventional gasoline engine car and diesel engine vehicle will be banned in the near future by UK and French governments in order to protect the global environment from conventional automobile exhaust gas. (e) In addition, in the combustion technology of the conventional automobile manufacturer all over the world a negligibly small vaporizing expansion pressure in the combusion of the fuel oil in the sealed combustion space is merely generated only as a necessary natural phenomenon for combustion. (f) On the other hand, according to the fuel oil by "The use technology of a special synthetic magnetic field", it was confirmed that a new unknown explosive vaporous expansion pressure that reaches 10% to 20% of the explosive thermal expansion pressure by conventional combustion, occurs immediately before the explosive thermal expansion pressure by conventional combustion. (g) Therefore, "Formation of tha air-fuel mixture gas thar can burn out completely", and "Shortening in burning time" each can be improved dramatically with the generation of a new unknown explosive vaporous expansion pressure caused by "The use technology of a special synthetic magnetic field". (h) Needless to say, due to progress of research on "The use technology of a special synthetic magnetic field", it is sufficiently possible to increase the generation anmount of the new unknown explosive vaporous expansion pressure to the current 10% to 20% or more. (i) As mentioned above,"The use technology of a special synthetic magnetic field" is a revolutionary technology that can sove the above mentioned fatal technical problem. (j) I am convinced that "The use technology of a special synthetic magnetic field" is a technology that can build bridges that can connect to the present and the future regarding energy securing, reduction of carbon dioxides(CO2) and prevention of air pollution. The present conditions of a heat engine. (2) In general, the decrease effect of the fuel consumption caused by the heat engine itself does not absolutely occur except following item (a) and item (b). 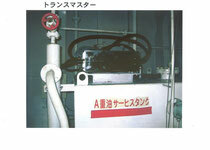 For details, Please refer to "Test data in Chapter 1"
The photograph below is an "E-oiler" device. (3) A dramatic characteristic change of the fuel oil managed by "The use technology of a special synthetic magnetic field"
(a) Because a new unknown explosive vaporous expansion pressure by the magnetism without generating heat is added prior to the conventional explosive thermal expansion pressure that occurs in the combustion in the heat engine, according to the fuel oil managed by "The use technology of a special synthetic magnetic field" the epoch-making decrease technologies of the fuel consumption, carbon dioxide (CO2), oxides of nitrogen (NOx) and micro-particulate matter (PM) are established at the same time. 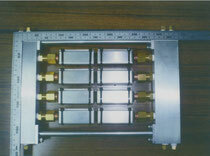 (b) In other words, according to "Test data in Chapter 1" and "Test data in Chapter 2" it was showing that the new unknown explosive vaporous expansion pressure by the magneism without generating heat of 10%~20% in the conventional explosive thermal expansion pressure, was already generated in many running tests of the heat engine. 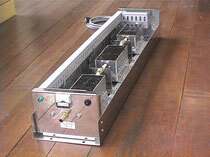 The photograph below is a "Parallel separator device" used in the large vehicle such as a truck and the bus. (a) The fear that the "Urea SCR system" which substantially removes oxides of nitroge (NOx) from the exhaust gas of large vehicles in particular will not function effectively from around 2012, occurred. (b) In order to protect residents from health damage caused by light waves smog, it is absolutely nacessary to satisfy the regulation value to minimize the emission of nitrogen oxides (NOx) from automobiles. The photograph below is the "Parallel separator device" of the "E-oiler" device that was set on the fuel tank of the truck. (a) According to the test results of the exhaust gas of the ship engine, the exhaust gas in temperature of the shpip engine was decreased 14 ℃. inside of a cylinder of the ship engine was greatly decreased. (c) Therefore, by the heavy oil "A" managed by "The use technology of a special synthetic magnetic field" it is considered clearly that the generation of oxides of nitrogen (NOx) caused by the heavy oil "A" is greatly decreased and is restrained in the ship engine. For details, Please refer to "Test data in Chapter 2"
The photograph below is three "Trans-master" devices that were connected in series. (a) According to "The use technology of a special synthetic magnetic field"
particularly because a voyage test is greatly influenced by a tide, waves and a wind of the sea, it is difficult to make clear the effects as the diesel engine like the truck. (b) However, it is clear that the decreasing state of the fuel consumption (namely CO2) by the new unknown exp;losive vaporous expansion presure by the magnetism without generating heat occurred in combustion of the heavy oil "A" in the inside of a cylinder of the ship diesel engine. in the conventional engine technology and sciece. (b) Anyway, because the data of the diesel engine of the ship on voyage speed, voyage time and the fuel consumption become very uncertain caused by the influences of tide, waves and a wind, it is impossible to get vertually the accurate data. can be just quoted without problem by data of the main engine of the ship. For details, Please refer to "Test data in hapter 2"
The photograph below shows the "Trans-master" device that was set on the service tank. (7) Improve carbon dioxide (CO 2) and black smoke emissions of coal-fired thermal power plants in operation. (a) Today, coal-fired power generation is considered to be the biggest cause of climate change and air pollution and is avoided from all over the world because it releases harmful exhaust gases such as carbon dioxide (CO 2) and black smoke by coal combustion into the atmosphere in large quantities. (b) However, even now, the power generation by coal fuel is inevitably used throughout the world due to unavoidable economic circumstances and social circumstances and it is the inevitable status that it must becomes the leading role in supplying electricity energy all over the world. (c) At present, according to the new air burning technology managed by "The use technology of a special synthetic magnetic field", in the combustion concerning coal fuel not only but also other fossil fuel, the reduction of fuel consumption (ie CO2) and the reduction of exhaust gas (ie black smoke) can be achieved and as a result it bring very epoch-making benefit to economic and social in particular. (d) For general combustion technology of boilers, fundamental technologies that use fossil fuels, water and air, which are managed by "technology of using special synthetic magnetic fields" have already been established by many tests already. (e) Therefore, at present it is in a situation that the reduction of fuel consumption in the large boilers for industrial use and power generation can be basically achieved. (f) In any case, it will be possible to improve the conventional bad image as a new coal-fired power generation that can contribute to reducing environmental pollutants such as fuel consumption (ie CO 2) and black smoke. For details, please refer to "Section 11 and 12" in "Test data in Chapter 1". (8) Oxidation function of the water and the air managed by "The use technology of a special synthetic magnetic field"
(a) By water and air managed by "The use technology of a special synthetic magnetic field" anaerobic bacteria (or creature) is selectively restrained without dangerous ozone, ultraviolet ray and radiation, and on the contrary the vitality of aerobic bacteria (or creature ) is heightened greatly selectively automatically at the same time. (b) In other words, the inhibition function for anaerobic (or creature) and the vitality function for aerobic bacteria (or creature) progress at the same time in parallel. For details, Please refer to "Test data in Chapter 3"
(9) The effects on environment by the water and the air managed by "The use technology of a special synthetic magnetic field"
(a) An ability of oxygen molecule managed by "The use technology of a specal synthetic magnetic field" is fundamentally differrent from the sterilization abilities by the conventional ozone and ultravioret rays and radiation. (b) In other words, the vitality of anaerobic bacteria (or creature) such as a putrefactive bacteria is restrained selectively automatically, and the vitality of aerobic bacteria (or creature) such as the yeast is promoted in parallel with selectively automatically at the same time. (c) Therefore, the water and the air managed by "The use technology of a special synthetic magnetic field" have the ability to keep the environment of every useful animal and plant in good condition bacically. (d) For example, microcystis and the mosquito larva are exterminated selectively automatically and small fish and an aquatic incect and a water-plant are brought up selectively automatically at the same time. "Sick-house" such as a toluene, cresol, formalin and thinner are deodorized and are dissolved. After te "Electromagnetic air cleaner" and evaporating dosh that injected liquid medicine in the enclosed space of 2,000~3,000 litters volume were included, the "Electrmagnetic air cleaner" was driven. (c) Test result : After 2~3 hours it was completely dedorized. (a) For example, according to the water of bathtub and shower, the wastes accumulated in the innumerable minute gaps in the whole body surface which could not be removed till now are removed and as a result a new originally health conditions that exceed conventional health conditions can be obtained. (b) Therefore, because the various choking up of the all sewage pipes in an area are removed by the drainage of the bathtub and the shower, all sewage pipes are keeping clean and can be normally maintained. (10) The water managed by "The use technology of a special synthetic magnetic field" is used to concrete. (a) An intensity of reinforced concrete is greatly increased because the touch area of minute cement particle with the pebbles, rough stones and the iron bars greatly increases, and a life span of reinforced concrete can be prolonged by preventing the oxidation of the iron bars. (b) Because the solidification reaction of the concrete is greatly promoted the solidification time of concrete can be greatly shortened. (c) Because the properties for the work (namely "Workability") of concrete can be improved a "Water reducing agent" to use in the secondary products of concrete can be decreased greatly or can be totally omitted. (11) Effect of the oxygen molecule by the water and the air managed by "The use technology of a special synthetic magnetic field"
(a) The test by the following technology is not carried out until now but the following technology is a new technology having the possibility that can be carried out. (b) Preventive effect by the water and the air for foot-and -mouth disease and the bird flu of the domestic animal will be greatly expected. (c) The development of the therapeutic methods from totally different physical point of view and a development of the medicines are greatly expected. (12) It is used in the electrolyte of dilute sulfuric of lead storage battery. (a) There is the possibility that "The use technology of a special synthetic magnetic field" for the electrolyte of dilute sulfuric of the storage battery becomes the ultimate energy technology. 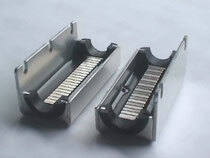 (b) Tday, "New lead storage battery device with new charging system" may be developed by the advancement of "The use technology of a secial synthetic magnetic field". (c) As far as the possibility of development exists, the above technology is ultimaite energy technology being worthy of the greatest efforts for development. For details, Please refer to "Test dat in Chapter 3"